Vassula’s address in Barcelona, like those that followed during the Spiritual Retreat in Fatima, Portugal, was about Church Unity. This is the unity for which Jesus pleads through His messages of True Life in God. He wishes for the Churches to take the first step and unify the dates of Easter. On January 16th, 2014, at 9.00 in the morning, Vassula, accompanied by her husband, set out from Rhodes, on a transit flight to Barcelona through Athens, where we met. In Barcelona we were welcomed by Pilar. We left our luggage at the hotel and set out almost straight away for the area of St. Cugat, where, in the “Casa de la Cultura”, Vassula’s address was to be delivered at 8.00 on the same evening. 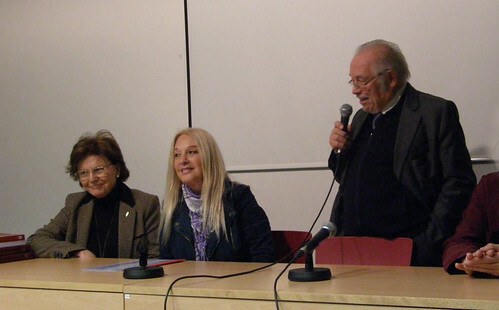 This meeting had been organized by the Evangelical pastor Josep Monells in co-operation with Pilar. 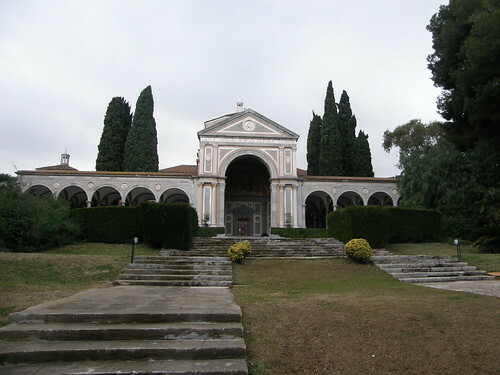 I have attended many of Vassula’s speeches and I have heard her talk about the Apostasy, the rebellion within the Church of Christ, about the signs of the end times, about the Father, the Holy Spirit, the Unity of the Church. However, each time, through her speech, the Holy Spirit illuminates different aspects and opens up new avenues so that we can better understand the Word and the Works of God! Upon entering the room, before Vassula had begun her address, there was an awkward atmosphere, perhaps even some apprehension about what the audience would hear. However, the words of Christ, delivered through the mouth of His prophet, touched all hearts. 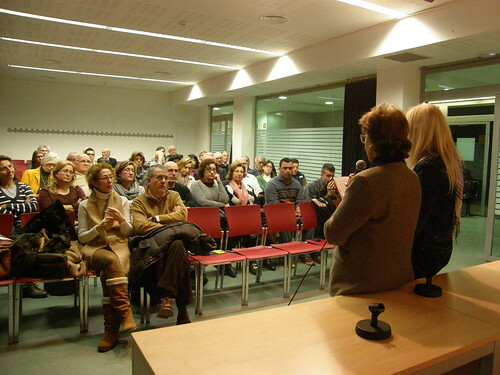 After Vassula had concluded, she responded to questions from members of the audience, who later rushed to buy the new TLIG book, which contains all of the messages in Spanish, signed by Vassula. On the following day, January 17th, Pilar and Victor, her husband, kindly took us sightseeing in Barcelona. Maria, one of Pilar’s childhood friends, led us through the “Holy Cross” Cathedral of the city and the picturesque alleyways of the old town, where Gothic, Arabic and neo-classical architecture co-exist. Our last destination was the famous “Church of Christ”, built by the well-known Catalan architect Antonio Gaudi, which has not yet been completed. 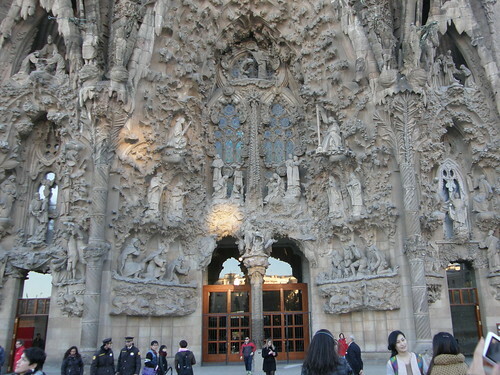 One of the entrances to the “Church of Christ”, by architect Gaudi. On January 18th, the first day of the week dedicated to Church Unity, we celebrated Vassula’s birthday all together. 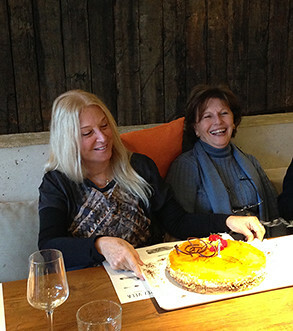 In a happy atmosphere, she blew out the candles on the cake and received birthday wishes from everyone present. 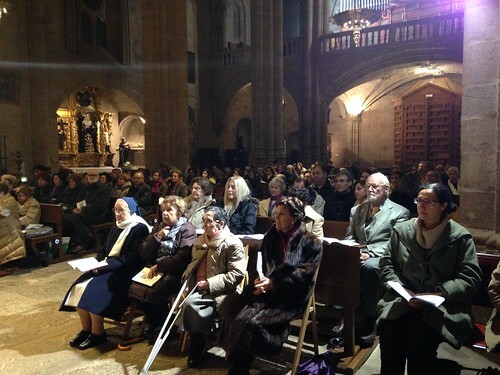 On the same evening, we attended the Ecumenical celebration of Church Unity in the Barcelona cathedral, with the following participants: the Archbishop of Barcelona, Roman Catholic clergy, delegates of the Greek Orthodox, Roman, Serbian and Russian Churches as well as Evangelical delegates. Only the Son of God can “gather into one the children of God who are scattered abroad” (John 11:52). On January 19, we attended the Holy Mass of St. John Chrysostom at the Church of Santa Maria de Montserrat, celebrated by bishop G. Agapitos. 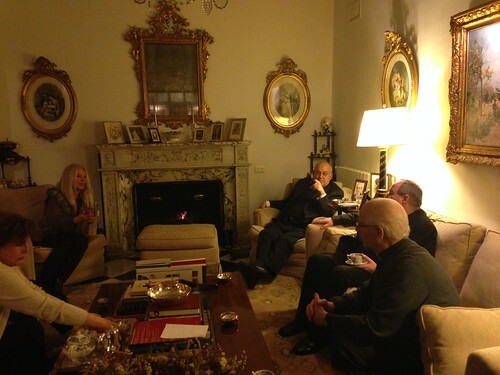 After the Holy Mass, the bishop talked about Vassula and the TLIG messages and invited her to speak. Among the congregation, there were people who were familiar with the messages and Vassula’s work. 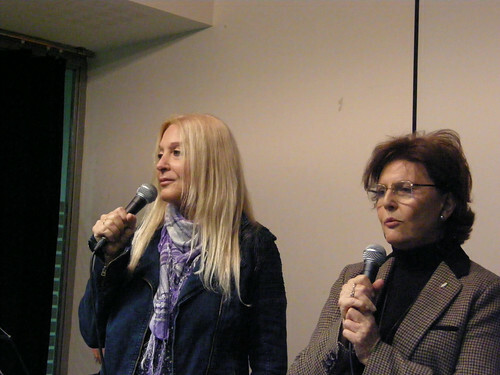 They spoke with her and were interested in the new Spanish edition of TLIG, containing all messages from 1986 to 2003. 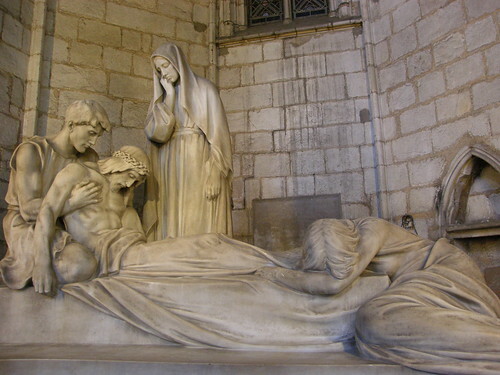 The Church of Santa Maria de Montserrat. 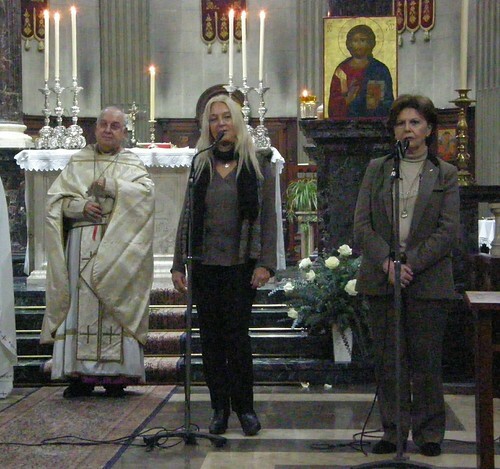 Vassula addressing the congregation. 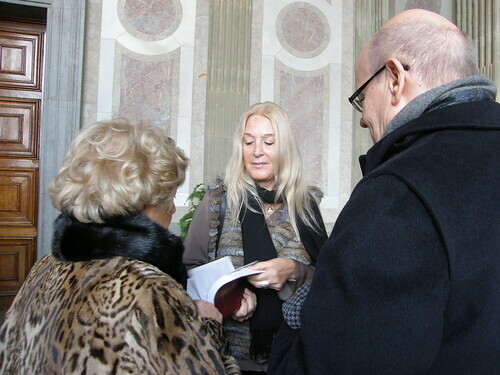 After Mass, she displays the new Spanish edition of the TLIG book to those interested. After having lunch with the bishop at his residence, we departed by train for Madrid and from there by car, on a three-hour journey to Caceres, a beautiful medieval town, with its walls still preserved. At Caceres, we stayed with Pilar in her medieval house. 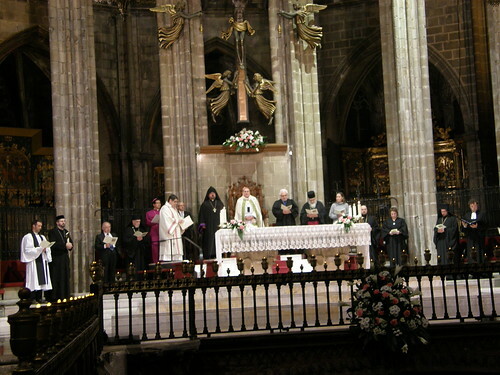 Everyone in the parish was aware that on the evening of February 20th, the Byzantine Holy Mass of St. John Chrysostom would be celebrated at the Caceres Cathedral. The church was filled to capacity. The interest that our Roman Catholic brothers took in participating in the Byzantine Mass of St. John Chrysostom was impressive. Caceres Cathedral filled to capacity, during the Byzantine Holy Mass. Vassula talking to priests about the TLIG messages and her mission. Detailed reports of some of Vassula's past meetings.